A revamped weekend tournament schedule at US-friendly BetOnline Poker features a bonanza of events that total more than $250,000 in guaranteed prize money, including the popular $50,000 GTD at 7:00 p.m. 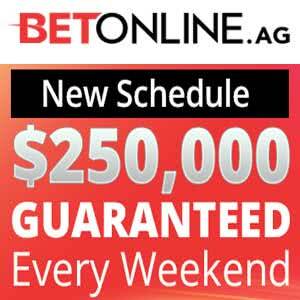 ET on Sunday, which is boosted to a $100K guarantee on the last Sunday of every month. The new schedule is a boon to online poker players in the US who like the typically soft action that BetOnline is known for. The site also has a reputation for offering a generous 100% up to $1,000 deposit bonus, a real bankroll boost for players on the lookout for value. And the best part… BetOnline accepts Bitcoin deposits! Speaking of value, take a look at the new MTT schedule below. The buy-ins run the gamut from $11 up to $215, promising tournaments to fit every budget. Starting times, type of tournament and guarantee, and entry fees for each are listed. Keep in mind that the last Sunday of each month, the 7pm and 8:30pm events are combined into one tournament that offers a massive prize pool of $100,000 guaranteed with a $109 buy-in. There is more to be excited about at BetOnline where new progressive Bad Beat Jackpot tables have players in a frenzy. That’s because the current BBJ is more than $400,000! If you’re seated at a bad Beat Jackpot table (designated as such with a yellow star) and you lose a hand with quad jacks or better (currently), you’re in for some riches. Even if you’re simply playing at the table when the BBJ is hit you can expect a hefty bankroll boost. Players need to remember that the qualifying hand to hit the BBJ changes, as it’s progressive. Its quad jacks at the moment. Check the banners at the BBJ tables to know what you need to qualify for the Jackpot. Remember too that the progressive BBJ is growing by the minute and could hit $1,000,000 or more someday! If you want even more exciting poker action in addition to the new MTT schedule and Bad Beat Jackpot, BetOnline Poker has also introduced Bounty Tournaments. It’s the latest craze in online poker because you win money everytime you send a player to the rail. The more players you knockout, the more money you make – and that’s in addition to the prize pool money. Simply look for the events designated with a “K” in the tournament lobby, and start KO’ing your opponents! With the revamped weekend tournament schedule, the exciting Bad Beat Jackpot, and a selection of Bounty Tournaments, it’s a great time to play poker at BetOnline.